Becoming Jane Austen is not the travesty you might think it is, considering the film that it has inspired; the filmmakers have apparently taken a general theme and a very little piece of the book and run, very far, with it. The book is a thoughtful look at Jane Austen’s life, and has some interesting things to say. 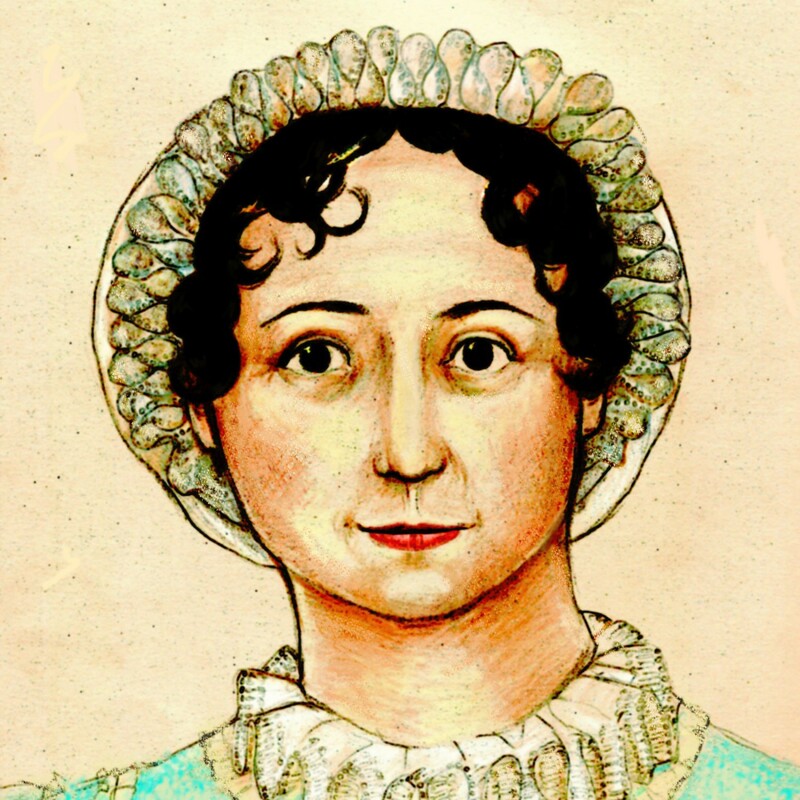 We ultimately found the author’s arguments unconvincing, but feel that interested Janeites should not hesitate to read the book in conjunction with less speculative biographical material. The book covers the basic outline of the little that is known about Jane Austen’s life; the difference from other biographies comes in the speculation on Jane’s motives and inspiration. Mr. Spence sees Jane’s brief romance with Tom Lefroy as the biggest inspiration in her life, along with the flirtation between Henry Austen and Eliza de Feuillide. Spence argues that Jane and Tom, rather than parting forever in January 1797, did have an understanding of sorts; Jane only had to pass muster with Tom’s demanding uncle, who was paying Tom’s way through law school. Spence speculates that Jane was not found an acceptable bride for an up-and-coming young barrister, but Tom never told her so; while she waited for him in vain, thinking that they were to be married at some point, she wrote Pride and Prejudice as a “gift of love.” Spence claims that Jane dropped in names from Tom’s family (his mother’s maiden name was Gardiner) and his favorite novel, Tom Jones (though Cecilia, from which Jane Austen took the title of P&P, also has a character named Bennet) as hidden messages for Tom, but he became engaged to an Irish heiress only a few months after the time of the alleged uncle-vetting, several months before George Austen sought publication for First Impressions. All this sleuthing makes for interesting reading, but one should keep in mind–as it is not really made clear by Mr. Spence’s writing style–that it is all speculation. Whether it is convincing is up to the individual reader. We would strongly advise against reading this book without reference to other works, equally speculative but written with equal scholarship, that have very different things to say about Jane and Tom; then make up your own mind. Another theme that Spence accords to Jane’s novels is coded messages to Eliza de Feuillide–first to stay away from Henry Austen, and then later to telegraph Jane’s approval of their marriage. We found the claim that Northanger Abbey is such a message to be particularly specious. How can anyone write about the meaning of Northanger Abbey without once mentioning The Mysteries of Udolpho? Indeed Mr. Spence makes no mention of the influence of literature on Jane Austen’s work, which we think is an unfortunate omission. We also found it interesting that the story of the Mysterious Suitor-by-the-Sea–the story Cassandra Austen supposedly told a couple of nieces about a gentleman who showed a romantic interest in Jane Austen, which Jane returned, somewhere around 1801, but then he died before he could pursue it–is relegated to an appendix. That brief romance, which admittedly may or may not have happened, and Jane’s purported interest in that gentleman, would pretty much explode most of Mr. Spence’s theories about Tom Lefroy’s influence on Jane Austen’s life and work, and putting it in almost as an afterthought strikes us as a trifle evasive. Better to try to explain it away within the text, we think. All this being said, we hold it a good thing to challenge one’s dearly-held beliefs once in a while; blows out the mental cobwebs and makes one rethink, re-evaluate and restate one’s position, even if one remains unconvinced by new arguments. So if you are interested in reading Becoming Jane Austen, Gentle Reader, we suggest that you do so, particularly with the film coming out; but we suggest that you balance it with more traditional approaches to Jane Austen’s life and work.